Hsp90 is an essential ubiquitous protein very abundant in eukaryotic cells. It is a highly multifunctional protein. Under heat stress it functions as a heat shock protein but at physiological temperatures it performs a number of essential roles. Streroid hormone receptor function, activity and stability of cell cycle related protein kinases and other essential proteins, telomerase function and ageing regulation have been assigned as Hsp90 functions. Hsp90 performs these functions in the context of different multiprotein complexes along with other proteins named cochaperons. 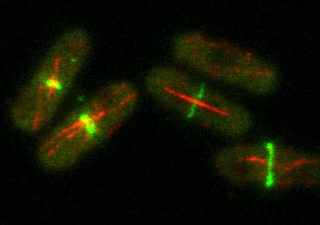 Using the fission yeast Schizosaccharomyces pombe as our model organism our group (started very recently) tries to reveal the role that Hsp90 plays in cell cycle regulation and ageing. Using Genetics, Biochemistry and Cellular Biology techniques we analyze the effect of mutations in Hsp90 in the commitment to mitosis and cytokinesis, alone or in combination with other cell cycle mutations. We have identified physical interactions between Hsp90 and cell cycle proteins, probably reflecting the existence of Hsp90 complexes and we are now trying to purify such complexes. Finally, we are checking whether the ageing retardation effect described in C.elegans for Hsp90 mutants is a universal phenomenon also present in S.pombe.